With a focus targeting the casual runner, the newly announced Forerunner 25 is a GPS watch with similar specs to last year’s FR15. Simplicity and affordability are key here; there’s no need for vertical oscillation readings like the Forerunner 620. Nor do you need a barometer to predict the weather for your 5k run (Fenix 3). Instead it’s all about an easy to use running watch that makes it easy to track your progress. So how does the Garmin Forerunner 25 compare to the Forerunner 15? I’ll cover what’s the same, and what’s different. Let’s go! As you would expect from a watch that’s part of the same range, the two wearables share many identical features. This ones a biggie, GPS helps to accurate manage your location throughout your run. With this chip, the Garmin can calculate total distance ran and how fast you are running. Turn this feature on, and if you stop for a little it on your run it’ll pause the watch for you. Great if you’re waiting for the green man at a traffic light, need to tie your shoelace, or just lose track of time having a natter with an old friend you bump into on your route. Pretty useful for breaking your run into mile splits so you can check your pace consistency as you workout. Pretty useful if you’re training for a marathon, the virtual pacer compares your current speed to one you agree pre-run. Letting you know the difference between the two paces, it can give you motivation to speed things up. I think it’s more useful ability is in advising a runner to slow down as at the start of a race, it can be all too easy for the adrenaline to take over and sabotage your rational plan. For a little satisfaction after a tough effort, both watches will deliver the good news that you’ve just beaten a watch record. This could be your fastest mile time or your longest duration run. Something to put a smile back on your face as you’re gasping for air! 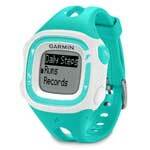 You might like: Garmin’s Forerunner 15 is a great running watch for beginners, here’s why. If you’re on a health drive, you’ve got to think about the activity you do outside of your runs too. Inside the FR25 and FR15 is an accelerometer which measures your daily steps and will set you personalised goals based on your step count history. These Forerunners will remind you when its time to move with an inactivity alert and can even provide sleep tracking data like total hours slept. Hookup a chest strap, and either of these watches can record your heart rate as you workout. This gives a runner context on the intensity of their workout. Heart readings can also help the Garmin algorithms calculate calorie data more accurately. Trust me, if you gain insight from reviewing your efforts on Strava or Garmin Connect, adding in heart rate data just gives you a clearer idea of your current level of fitness. A heart rate strap can be bought in a bundle with either watch for a little bit extra. If you hate wearing chest straps but want heart rate data, check out the Forerunner 225 which records your pulse from the wrist. An optional extra you can add to your laces. Basically can measure the distance you run if you run on an indoor track or on a treadmill. It’s an estimation based on your stride length and total strides but is a good fallback when a GPS signal just won’t reach you indoors. Admittedly not the largest storage history, it’s modest if you average 2-3 runs a week. To hold onto your running data you just need to transfer your activities to Garmin Connect. As you can see, there are so many similarities between the two watch releases. Now here’s a few tech specs on where they differ. For a budget GPS watch, this is a feature similar to those premium smartwatches out there. It’s key use is for transferring data wirelessly to your Garmin Connect profile but there’s other extra perks such as viewing texts and emails on your wrist and seeing whose calling you if you’re at the gym and your phone is in your bag. What I’ve found with using my Vivoactive is that there’s a huge convenience with this connectivity also in the FR 25. After a run, once your watch is within metres of your phone and you’ve refreshed the Garmin Connect app, your run will be uploaded wirelessly over Bluetooth in seconds. It’s so much easier than hooking up to your computer over USB like you need to with the Forerunner 15. To make the most of this connectivity though, your smartphone does need to have Bluetooth 4.0 (Bluetooth Smart) and probably should have been manufactured in the last 2 years. FR 25 is lighter but you probably wouldn’t notice it. OK we’re only talking a couple of grams here but the Forerunner 25 weighs less than the older FR15. How much difference? A 5g difference between the small watch size, and 4g between the large. Fair play to Garmin who have managed to shave off an 1/8th in weight of the small watch. Actual sizes below. Both watches use a rechargeable lithium-ion battery but according to Garmin, you may be able to squeeze a little extra battery out if you opt for the Forerunner 25. Both small watch variants give you the same 8 hours in jogging mode, but only the FR25 gives you 8 weeks battery when used as a standard watch with lifestyle tracking; 3 weeks longer than the FR 15. The larger Forerunner 25 goes a step further to offer 10 hours for training and 10 weeks for general watch usage. 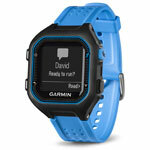 Comparing on Garmin’s website, there isn’t a huge price difference between the two models. 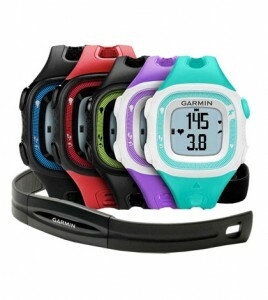 Watches without the heart rate monitor start at $139 for the FR 15 and go up to $169 for the FR 25. There’s only £10 difference on the UK site, meaning the upgrade to Bluetooth connectivity is a steal. Prices on Amazon show a greater difference meaning there are savings to be made on the Forerunner 15. So there you have it, aside from slightly different designs these watches are do pretty much the same job. Go for the convenience of uploading your runs over Bluetooth with the FR25 or save money on a reduced FR15.